Synchronization of all media types. Support for universal file formats. Additional Support for Macromedia Flash format. Advanced, tree menu topic navigation. Producing slides with mathematical expressions. Support for multiple speakers (interviews, etc.). Immediate previews of work in progress. Access to affordable authoring support services. Support for translation/localization of content. Publishing of presentations to web servers. Publishing of presentations to CD-ROMs. Option to create pay-per-use presentations (with royalties). Compare Openworld Presenter with other's authoring tools. Compare Presenter Plus and Basic version features. One of Openworld Presenter's advanced features is its ability to synchronize several media types streaming in parallel. This is achieved through use of the open standard synchronized multimedia (SMIL) streaming format. In its current version, the user can define a video or an audio media file as the "pilot" track, and then synchronize all other media tracks -- such as scrolling text transcripts, graphic slides, and hyperlinks - to display at specified times while the "pilot" track plays. This can be accomplished during the authoring process simply by pausing the pilot track and then "dragging and dropping" its time value to the other elements of the presentation that one wishes to synchronize. Please look at the example (click on the image) for details. Openworld Presenter Plus offers various screen layouts for presentation. There are several adjustable layout templates, allowing the author to choose videos and slides of different sizes and to adjust the area assigned for display of context-sensititive hyperlinks and scrolling text (transcript). A powerful visual Layout Wizard included in the Openworld Presenter Plus bundle allows the author to modify the presentation screen layout in seconds. This can be done by dragging and moving the edge of any presentation element areas (areas reserved for display video, slides, scrolling text and hyperlinks). You also can assign font attributes such as style and size for text regions (such as fields for transcript and hyperlink display) and assign background images for such regions as podium and notebooks (hyperlink backgrounds). Openworld Presenter uses the open standard synchronized multimedia (SMIL) format as its basis for synchronizing presentations, the widely-accepted RealMedia or MPEG formats for its video/audio tracks, the RealPix format for slideshows of images, and the RealText format for display of scrolling text and hyperlinks. These ingredients make Openworld Presenter fundamentally compatible with RealOne Player - one of most popular media players in the world. People can easily use previously prepared RealMedia files when authoring new presentations with Openworld Presenter. New versions (1.21 and higher) of Openworld Presenter also support Macromedia FLASH format for both video and slides, so authors now can assemble a sequence of FLASH clips into one continuous presentation. Using new versions of the Openworld Presenter authoring tools also lets authors assemble a "video" channel from several video/audio tracks playing in parallel or in sequence. As a result, creators of rich media presentations no longer require a separate suite of complex and expensive video editing tools. Openworld Presenter Plus also includes a powerful Media File Encoder which supports conversion of many popular video/audio formats including AVI, MPEG, ASF, MOV into AVI or RealMedia format. It also allows extraction of audio tracks from AVI files, with the ability to save these files into WAV file formats compatible with automated Speech-To-Text conversion systems - enabling automated transcription of video/audio. This feature simplifies authoring of e-learning materials such as lectures and seminars. Openworld Learning, LLC has recently released new software called FlashDigger. This freeware tool is a useful companion to Openworld Presenter, in that it enables authors to explore SWF files and extract graphics and sound resources from them. FlashDigger also allows saving a mute copy (without soundtrack) of your SWF file. This feature can be valuable in reducing the original file size after the soundtrack is exported. Exporting a sound track also makes it possible in cases where RealPlayer cannot play certain SWF files that have sound embedded. In these cases, Openworld Flash Explorer allows authors to extract a soundtrack, save it in the MP3 file format, then combine the elements into a "videotrack" inside OP Plus, using a mute SWF animation and this extracted MP3 soundtrack. Authors also have the option to extract graphic files (such as JPEG, PNG, etc.) and use them as slides in combination with other Openworld Presenter slides. New FlashDigger Plus version 4.06 (activated) opens several advanced features, such as SWF file editing, hyperlinks addition/updating for the movie or its part, graphics and sounds updating, etc. You must activate FlashDigger Plus to open these advanced features. Click here to download FlashDigger. Click here to order. One of the most advanced Openworld Presenter features is its ability to create a highly navigable presentation with multi-level "tree" menus. This feature allows to users to navigate quickly across very long presentations, finding topics of interest quickly, and then "drilling in" to the segments of greatest interest. Openworld Presenter Plus even supports creation of online versions for web-based presentations that include tree menus. You can see these presentations in our Samples Gallery. Advanced Online Presentations can be built with the Openworld Online Tools Pack, including Java-based TreeView and search engine utilities. These tools together create highly navigable online presentations. Openworld Presenter can create slides even as the author types in items for the topic navigation menu. This is achieved via creation of special text files that can be automatically imported into MS Powerpoint. These files have a simple "hierarchical outline" structure that enables each slide to have bulleted text. A new slide title is created automatically each time a new content topic is created. Authors have options then or later to create bullet text subitems in the Slides work pane. Authors also can add comments to any slide, requesting graphics or other enhancements from coworkers or from specialists in Openworld's Telepartner network. Openworld Presenter Plus also includes Slide Producer, which automatically launches Powerpoint in the background and creates a set of slides for immediate viewing within the presentation. 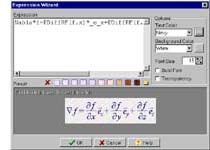 Starting from version 1.24 Openworld Presenter includes Expression Wizard - a comprehensive visual tool, which can create slides with a complex mathematical expressions. All you need to create an expression is to type your expression, using quite simple syntax. You can click the image at rights to see a demo. Expression Wizard lets you create a slides with various background and foreground colors. Also several background textures are available. You can apply a texture to your slide just by one mouse click. Moreover, it is possible to apply a semi-transparent textures in PNG format. In this way you can produce professional quality slides without any additional graphic editing tools. Transparent texture samples are included. A comprehensive help file is available, containing the full description of the expression creation syntax (where all reserved words, tokens and functions are described). You can download Expression Wizard helpfile here. Openworld Presenter Plus excels in preparing multi-speaker presentations such as interviews, discussions, etc. Each speaker's title can be set to appear in sync the speaker's comments. This is achieved by typing in the speaker's title in the Speaker Title edit box. Openworld Presenter then adds a new speaker title to the speakers list for the current presentation. Speaker titles can be added manually using Speakers dialog (click on the image for details). Openworld Presenter supports drag-and-drop authoring. You can drag and drop time values into any presentation element (as shown above) from the paused video/audio. You can create a hyperlink to any presentation topic by dragging and dropping the topic from the content tree menu pane into a Notebook field. The topic title will appear there as a hyperlink title, along with a special RealPlayer navigation command for users to jump to the target topic in the course. You also can drag and drop into a Notebook field the URL from any web page that is open in your web browser. This means that authors need not be experienced in HTML coding or in Realplayer scripting -- Openworld Presenter will handle the chores of URL creation. If advanced authors so desire, however, Openworld Presenter also allows them to insert special RealPlayer commands and RealText tags. Please click on the image to understand drag-and-drop features that are supported. Openworld Presenter lets authors preview a presentation even before it is completed. Authors can press the Export icon in the toolbar (or do File-Save, File-Export) at any time and current presentation state will be saved in a format that can be viewed using the built-in version of Openworld Presentation Player. Only two mouse clicks are needed to preview the work. Moreover, Openworld Presenter allows for "animating" certain presentation elements even during design time. Authors can set the auto-scrolling feature (in File- Preferences-Transcript menu) to see approximately how well synchronized the playback of the transcript is with video. The current video position (during playback) is sent to position the transcript. This helps authors adjust the time values to achieve raw synchronization of video and transcript. In extended presentations, there may be challenges where the transcript drifts out of sync with the video. Openworld Presenter offers a special feature to correct this problem - authors can insert a time marker that brings the continuous transcript into alignment. In this way, complete synchronization of transcripts can be achieved even for presentations with many hours of video/audio content. Finding researchers, transcribers, graphic designers, programmers, and translators can be a challenge for authors of rich media presentations and e-learning courses. Openworld Presenter tools make it possible for authors to invite specialists from around the world to help on their projects. You can find service providers through Openworld Learning's forthcomingg Telepartners Forum of virtual interns and work-study teams. Many of these individuals are interested in building track records and references prior to becoming entrepreneurs. Or you can post your requests in competitive electronic markets such as Elance.com and Smarterwork.com where entrepreneurs and professional firms bid to deliver your work on a compensated basis at exceptionally affordable rates. Openworld Learning and Development Informatics are launching the Telepartners Forum as a way to encourage creation of global e-learning authoring teams. Through Telepartners, you can engage virtual interns and work study teams across the Digital Divide. Telepartners opens new pools of talent for authors to work with in Africa, Asia, the former Soviet Union, and economically distressed areas in the Americas. The resulting experiences provide a springboard to larger opportunities for students and micro-entrepreneurs around the world. Authors will have opportunities to post their requests for help and profiles of project opportunities either in the public Telepartners forum, or in invitation-only sponsored forums. Interested parties then directly work out the terms of assistance -- including at least symbolic compensation and a "graduation" path to more rewarding opportunities upon satisfactory completion. As work progresses, the authors/project originators will provide feedback as work progresses to members of the Telepartners team that they have selected. This helps Telepartner team members gain useful insights and build track records useful in launching ventures in the global market. Those who graduate from Telepartners virtual internship and work study projects with high feedback ratings will be eligible for Openworld Learning-funded scholarships and other benefits that can launch them as full-scale participants in online marketplaces. Openworld Presenter Plus allows authors to create web-based presentations that can be uploaded to a web server. Using a new advanced Openworld Learning web solutions package (Openworld Advanced Online Tools Pack), authors can embed a presentation into a web page. The Tools Pack contains Java applets, CGI and PHP code for dynamic web pages generation. Each online presentation produced with the Pack can contain a navigation tree menu and an embedded search engine which lets users search content topics or a special keywords index file, in cases where presentation authors have earlier defined a keyword set for each presentation topic. This keyword index file makes it easy for viewers to find a topic of interest very quickly. The Openworld Presenter Advanced Online Tools Pack can generate a tree menu file and other files necessary for web-based presentation once the project is saved and exported in online delivery format. Openworld Presenter Plus simplifies production of CD-ROM presentations through a specialized "CD Image" toolbar icon for this purpose. It takes only few mouse clicks to produce a CD image on your hard drive ready to be burned on a CD-R or CD-RW drive. All the author needs is to select a drive (physical or virtual) where CD image will be saved. This may be any existing drive or partition on the author's PC. If the author prefers, the image file can be put onto a new virtual drive in any folder that the author designates. Authors can also create specialized subfolders in the target actual or virtual location. This allows authors to prepare a single, complex CD containing multiple presentations. All necessary directory structures will be prepared automatically within moments of pressing the "OK" button. If desired, special "launcher" programs can be included that ensure a designated presentation is launched automatically upon CD insertion into a PC. This makes it simple to produce specialized kinds of presentations, including demonstration of products and services, corporate presentations, e-learning courses etc. Openworld Presenter Plus provides support for pay-per-use presentations that produce revenues for presentation authors. Using the Openworld Advanced Online Tools Pack, authors have the option to prepare royalty-generating presentations for web-based delivery. This option is activated with the author selects the "pay-per-use" setting in Presentation Type page of the Project startup dialog (when Openworld Presenter is launched) or later chooses to do so in the File-Preferences menu. When checked, this option produces presentation content files suited for pay-per-use presentation delivery. Pay-per-use presentations look like an ordinary web-based presentations (see above), but the account state (account balance) of the viewer is shown in "Status" line (below the search engine field) whenever the user stops the presentation. Total delivery time is calculated (at the server side) and the balance is returned calculated according to the author's predefined per-minute price of the presentation delivery and the total delivery time. No special knowledge of HTML or Java coding is required on the part of the author -- all necessary scripts and files are generated automatically. The feature comparison table here provides a summary of essential differences between Openworld Presenter Plus authoring tool and other authoring tools known around the world. Simultaneous streaming of video/audio, slides, scrolling transcript and hyperlinks. Simultaneous streaming of video/audio and slides. Tree-shaped navigation menu available for both online and offline presentation versions. Synchronization of slides, scrolling transcript and hyperlinks with video/audio. Synchronization of slides appearance with video/audio. Synchronization of speech transcript scrolling with video/audio (especially for long-time speeches). Automated tree-shaped "slides canvas" creation simultaneously with topics creation. The feature comparison table here provides a summary of essential differences between Basic (freeware) and Plus (shareware) Openworld Presenter versions. Only the differences between Basic and Plus versions are shown; all other features described above are present in both versions. support for multi-speaker titles within a presentation. Using the Openworld Presenter Basic, authors can produce presentations playable in both RealPlayer and Openworld Presentation Player, publish them on the web, or prepare CD-ROM images. The Plus version allows authors to do these things automatically (with embedded tools). Presentations created with the Plus version can also support custom logos at a small additional charge if desired by the author. Support for MPEG file format for video track. Synchronization of scrolling transcript with video/audio for a very long presentations (using "time markers" and variable scrolling speed setup). We recommend the freeware Openworld Presenter Basic for short presentations, and the shareware Plus version for producing highly navigable, polished, or comprehensive presentations. Click on link below to download Openworld Presenter version most suitable for your needs. Our advanced version, Openworld Presenter Plus, costs just $69. And you can download a full-functional 30-day trial version right now! The entry-level Openworld Presenter Basic authoring tool is freeware. It offers basic features as described above - and is yours without charge.